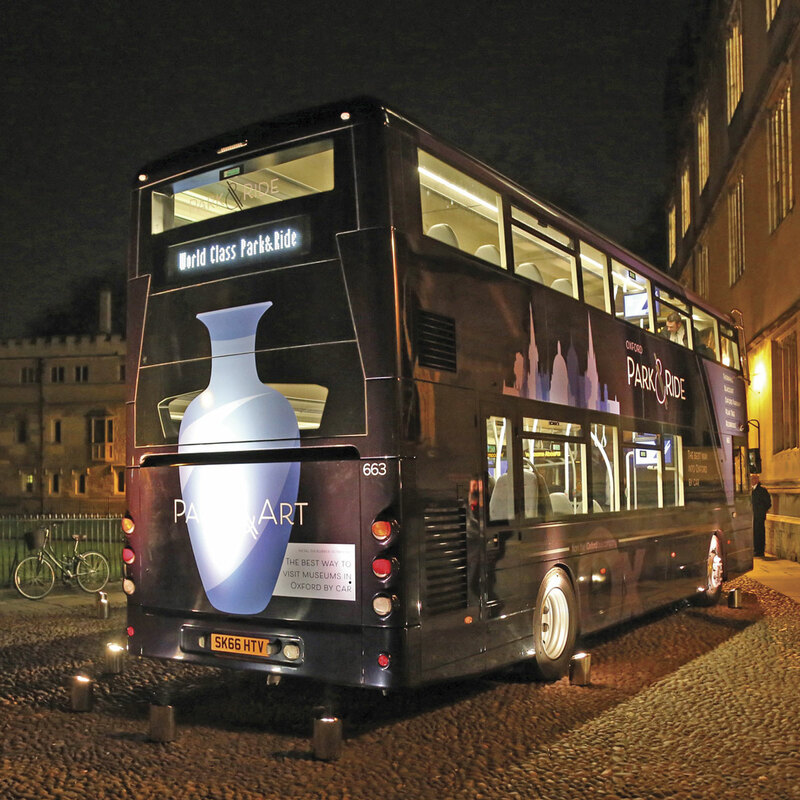 Stakeholders from organisations across Oxford and beyond joined the Oxford Bus Company team for a reception in Oxford University’s Divinity School. Welcoming guests, MD Phil Southall referred to Oxford’s reputation as a world class city and the role his company and its predecessors has played and will continue to play in supporting its mobility. In a wide ranging presentation, he looked at the past, present and future of public transport, celebrating how it is changing with the city’s development. Particular emphasis was placed on how the company is working with its Oxford City Council and Oxfordshire County Council partners in preparing for the future. High on the agenda is the changing face of shopping in the city with the massive Westgate development due to open during October 2017. The Oxford Bus Company’s roots go back to horse trams introduced to the city in 1881. Due mainly to objections from the University, the tram routes were never electrified and buses began their path to supremacy in 1913. The resultant City of Oxford Motor Services operation was owned by BET until nationalised in 1969 as part of the National Bus Company, growing to encompass most of Oxfordshire and some areas beyond. 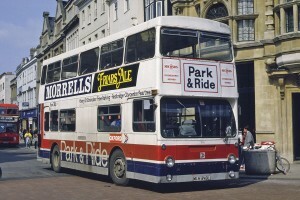 The Oxford city services were separated out in advancement of deregulation and privatisation, a management buy out securing the company in early 1987. In turn they sold the business, which was subject to significant competition on key routes, to the Go-Ahead group in 1994. 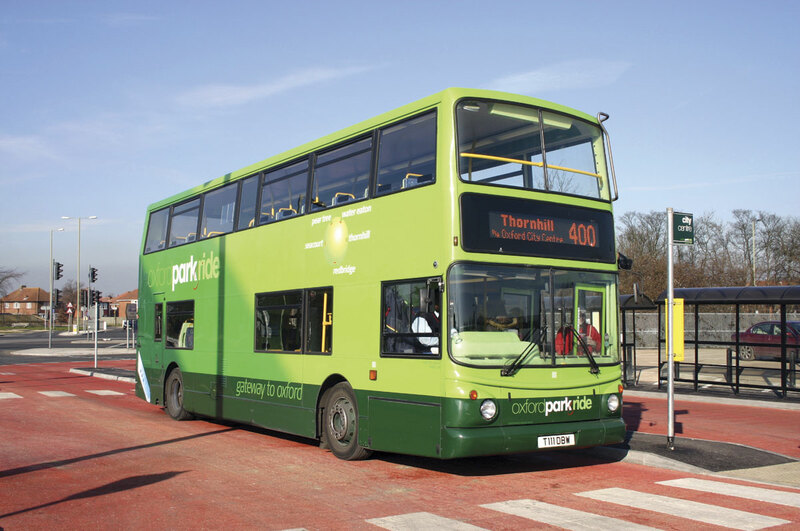 The company has been at the forefront of park and ride operations since the 1970s and has developed its frequent express coach services to serve not only London and Heathrow airport but also Gatwick and more recently Birmingham airports. The first smartcard based ticketing scheme, the key, was introduced in 2007 followed by the multi-operator SmartZone scheme in 2009. In his presentation, Phil noted that the ‘back office’ costs of running this scheme were just 0.27% of income, compared to around 10-14% for Oyster. The Transform Oxford initiative also contributed to environmental improvements in Oxford, reducing the number of competing vehicles on certain corridors. 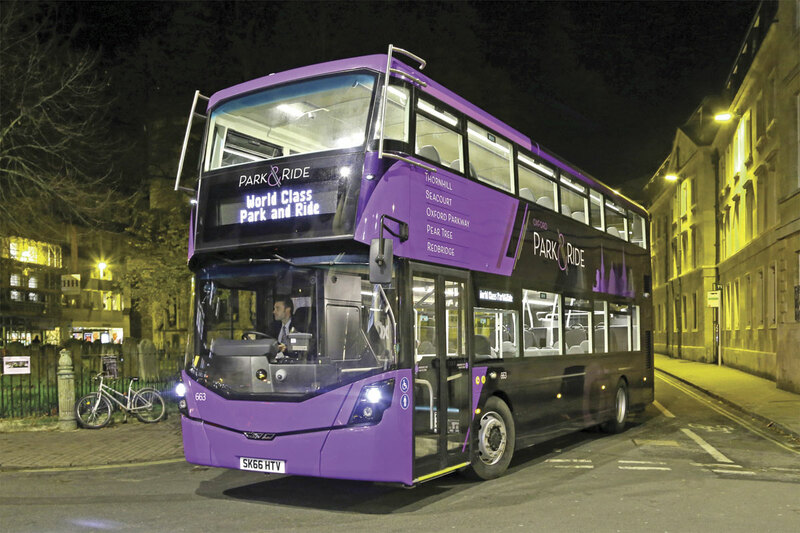 Upgrading of vehicles’ exhaust treatment systems and the acquisition of hybrid vehicles, including flywheel hybrids for the Brookes Bus university services continued the process and in 2014, the city centre was declared a Low Emission Zone (LEZ). Phil referred to the challenge of ‘keeping the quality up in what is a very demanding city.’ The current fleet of some 165 vehicles has an average age of around five years and operates from a modern depot in Cowley where power is generated by roof top solar panels and LED lighting has been installed throughout. Staff numbers make the company the seventh largest employer in Oxford. A new customer service lounge has recently been opened in Gloucester Green coach station, replacing a presence in the city’s Debenham store which was seen as innovative when first opened. 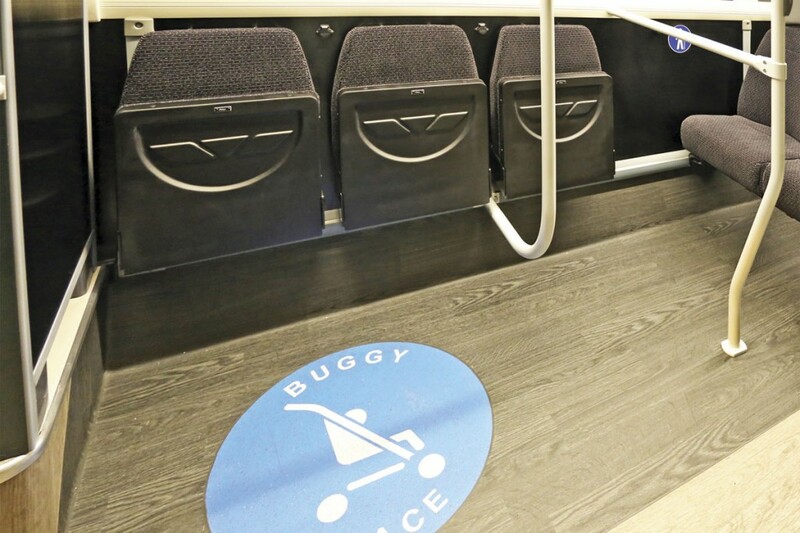 The new facility also provides a better waiting environment for coach passengers. 2016 has seen the roll out of mobile ticketing across the fleet and the commencement of colour coding vehicles to routes, a process that will be completed in 2017. 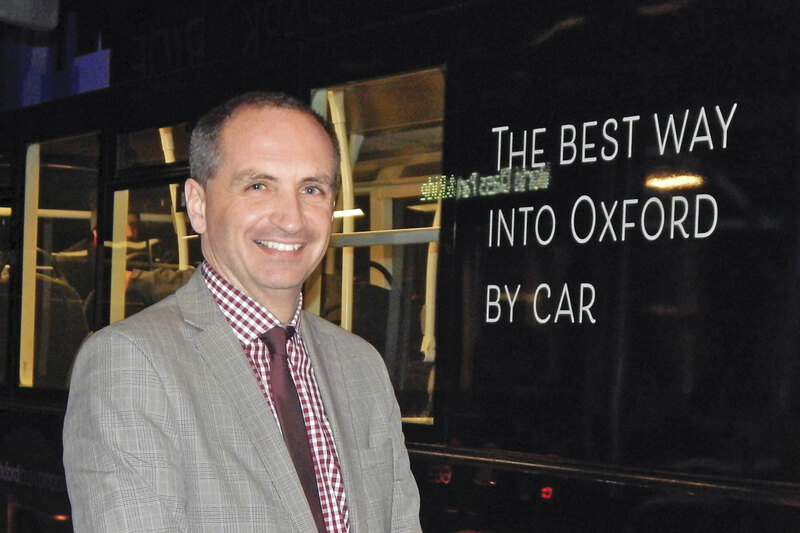 The presentation looked at the potential for the bus in Oxford on a five, ten and beyond ten year horizon. Within five years, initiatives such as workplace parking levies, congestion charging and additional bus priority would be required to tackle congestion whilst steps would be taken to initiate a zero emission zone in the city centre. In this period, ‘Mobility as a Service’ (MaaS) will be delivered based on the Zipabout project in conjunction with Oxfordshire County Council. On the ten year horizon were projects such as BRT corridors, additional park and ride sites outside of the ring road and the completion of the zero emission zone. Beyond the ten year horizon were potentially guided busways, bus tunnels and autonomous vehicles. Alongside these physical projects, there would be continued simplification of payment systems through mobile phone technology and, potentially, biometrics. 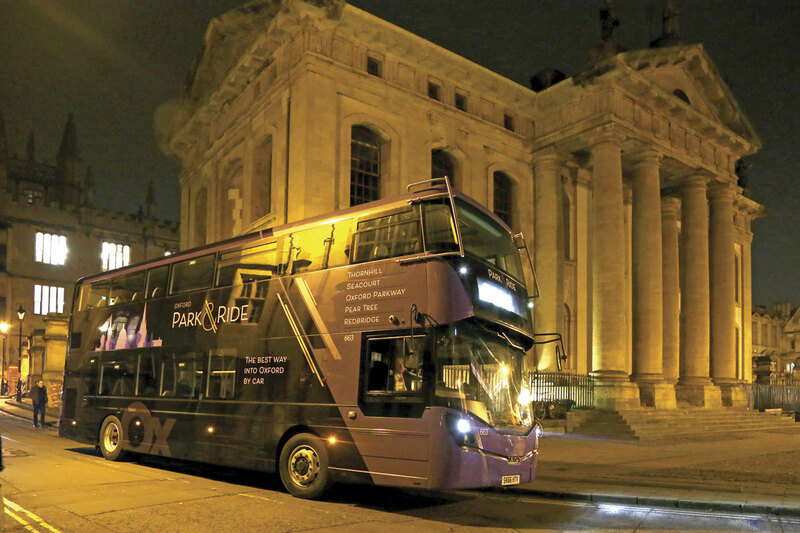 Oxford’s pivotal role in the development of bus based park and ride was covered extensively in Phil’s presentation. The first, temporary, operation was instituted in the 1960s with the permanent site at Redbridge to the south of the city opening in 1973. This was joined by the Pear Tree site in the north in 1976. Dedicated bus services then operated across the city between the two sites. 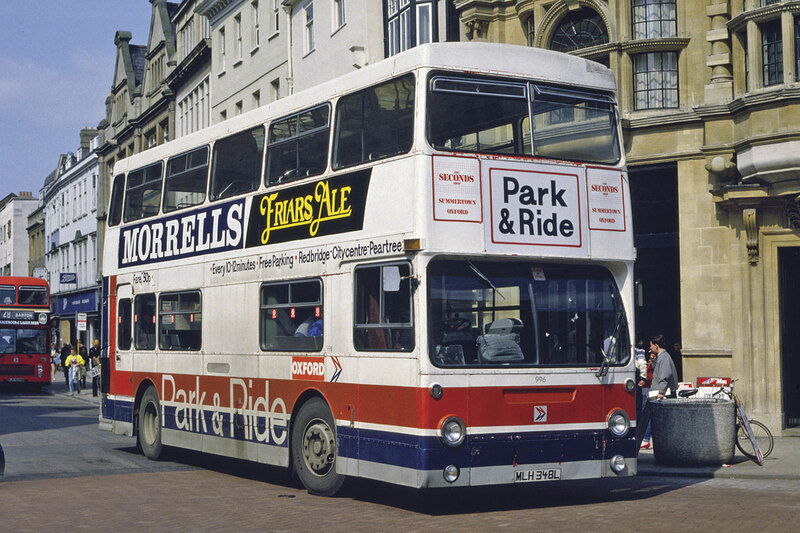 This service was not troubled by the low bridge at Oxford Station so could be operated by full height double-deckers, costs being minimised by the use of a series of second hand vehicles. Each type carried a new livery style: 1963 Daimler Fleetlines from Midland Red carried a dark blue scheme with a white flash applied ‘Starsky and Hutch’ style after a TV series of the time; early 1970s Daimler Fleetlines from London Transport together with a Leyland Olympian prototype originally intended for the Far East were predominantly white with sponsored advertising and Leyland Titans cascaded by Go-Ahead from London wore a blue, yellow and white scheme. 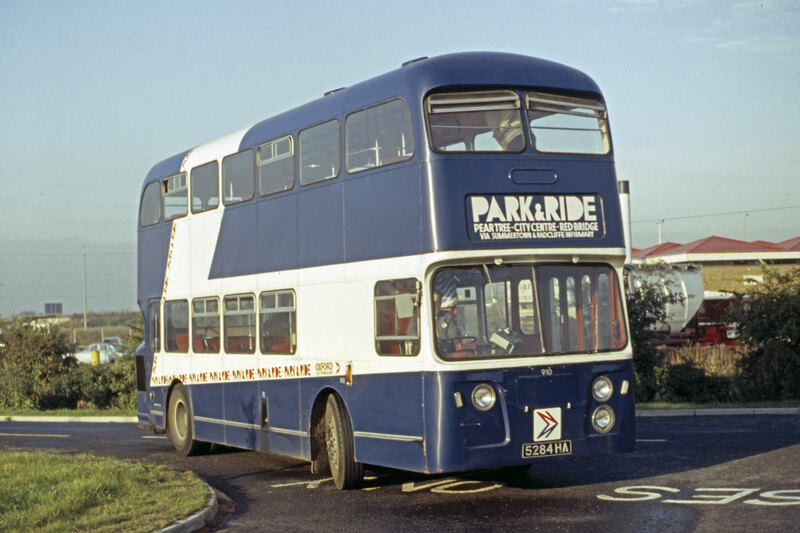 Further sites were opened at Thornhill in the east and Seacourt in the west, the service between them requiring low height vehicles and a batch of 1987 dual door Leyland Olympians in the predominantly white scheme were the first new buses specifically for park and ride operations. A fifth site at Water Eaton, opened in 2002 and now named Oxford Parkway following the development of a rail connection, was predominantly served by single-deck vehicles until double-deckers with cycle carrying capability were introduced to compliment the first phase of the rail operation. 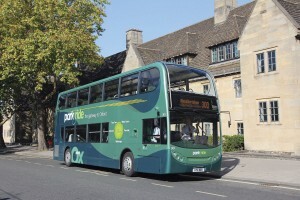 A step change in the standard of vehicle provision occurred in 1999 when Oxford Bus Company invested in its first low floor double deckers, low height Dennis Tridents with Alexander ALX400 bodywork carrying a new green livery. In turn, these were replaced by ADL Enviro 400H hybrid vehicles in 2011, again in a distinctive green park and ride livery. 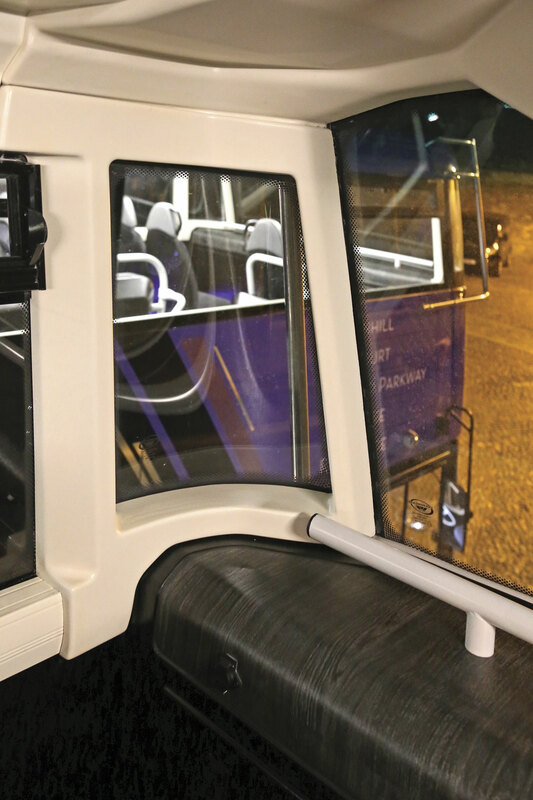 In pursuit of delivering a world class park and ride system, the hybrids are being replaced by a new generation of vehicles that focuses strongly on improving the customer experience. 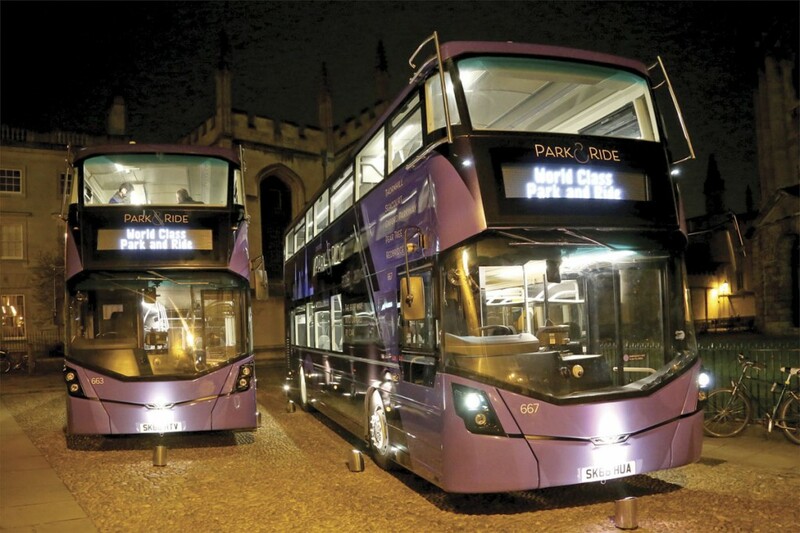 The hybrids will transfer to other Oxford city services in a vehicle cascade which will see the original non DDA compliant park and ride Dennis Tridents leave the associated Thames and Carousel fleets. 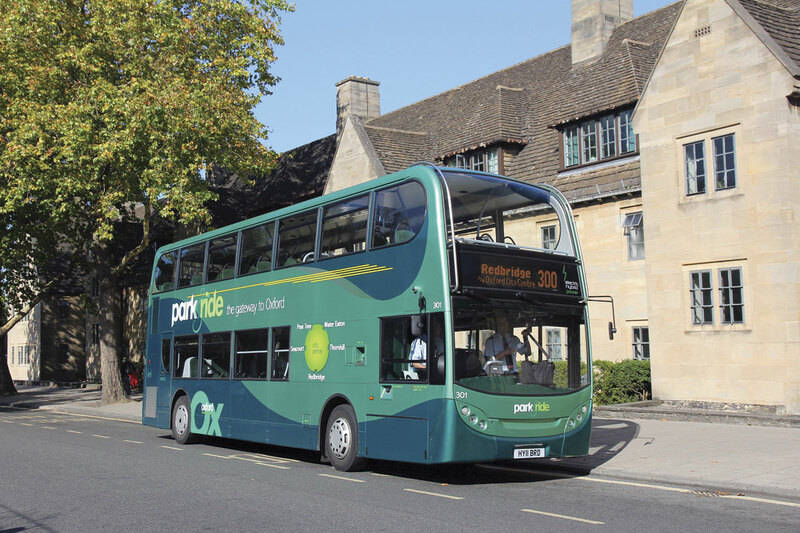 Park and ride now intercepts around a fifth of all cars heading towards Oxford city centre, adding their occupants to the regular bus patronage in the city means an impressive 55-65% of people in the city centre have arrived by bus. At the end of the presentation in the Divinity School, Phil invited guests to join him in the courtyard outside to see the vehicles ‘that will take travel to the next level.’ Adjacent to the Radcliffe Camera, two of the new purple park and ride fleet had been brought up for inspection, their bright interior lighting proving a beacon in the otherwise dimly lit and tranquil historic surroundings. 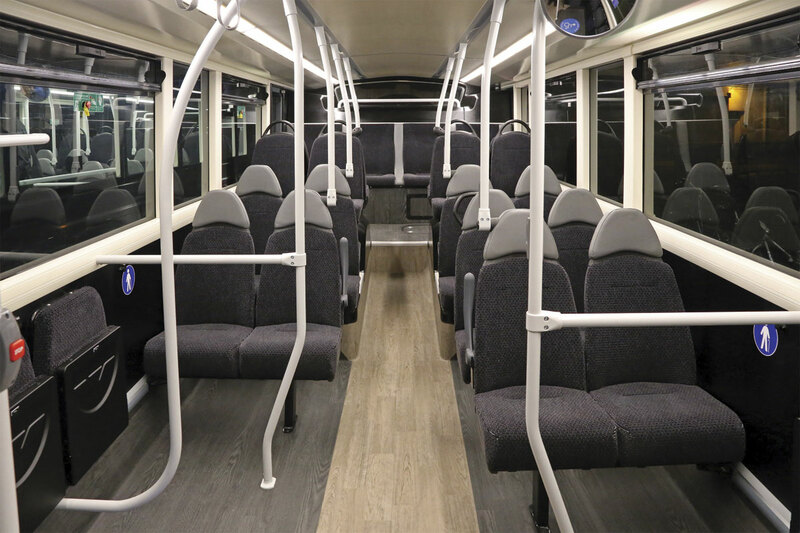 In a £6.7m investment, Oxford Bus Company is taking delivery of 30 Euro6 Daimler engined low height (13ft 10in) Wrightbus Streetdecks that will enter service during 2017. 20 of them are for the park and ride services featuring a new look throughout developed by Best Impressions. 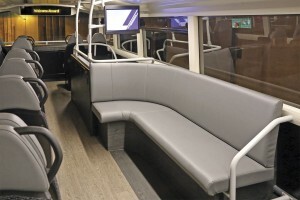 They have a capacity of 98 or 95 plus a single wheelchair with 65 seats including six tip ups. The seats themselves are mainly Isri Civic V3 units trimmed in fabric with leather headrests. 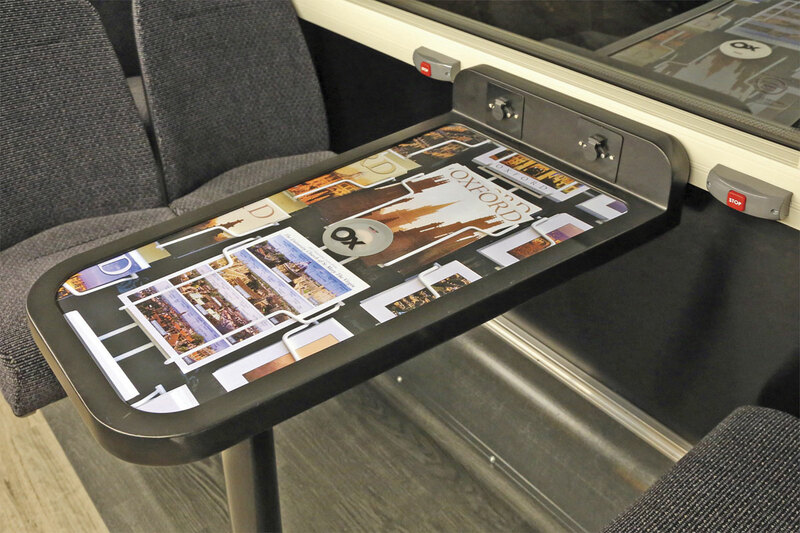 The upper deck features two tables with wireless phone charging facilities, each table incorporating a different Oxford motif. Noting the popularity of such features with the student population elsewhere, there is also a leather trimmed corner lounge area immediate behind the staircase. USB charging points are installed throughout. 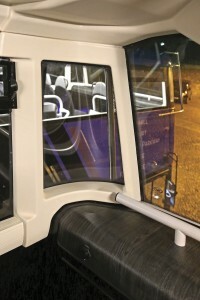 Forward visibility from the upper deck has been significantly improved in comparison to previous low height Streetdecks, these being the first such vehicles to feature the glazed A pillars initially specified by Lothian on full height vehicles. The forward display screen has also been re-profiled to reduce its intrusion into the window area whilst maintaining the capability to deliver the information customers require. Audible and visual announcement systems are available on both decks. These will provide a welcome message at termini and details of boarding and alighting points together with information related to the city. 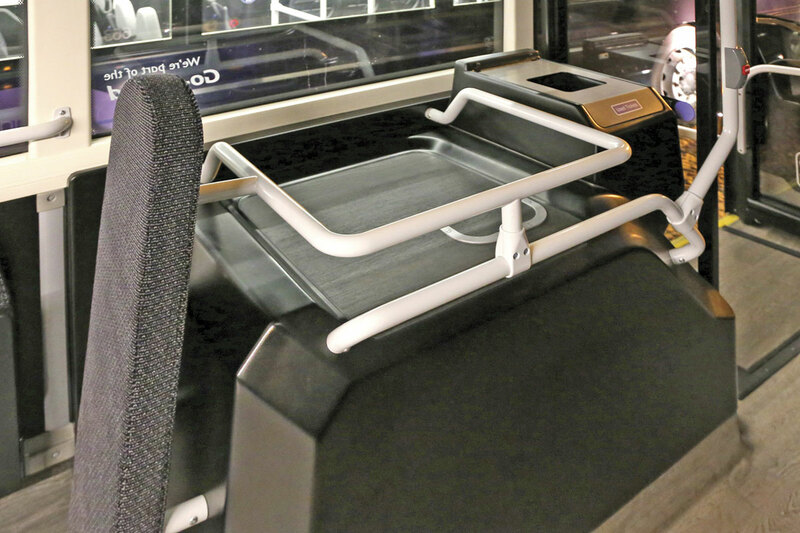 The lower deck incorporates a small luggage rack, rated at 50kg and a litter bin. 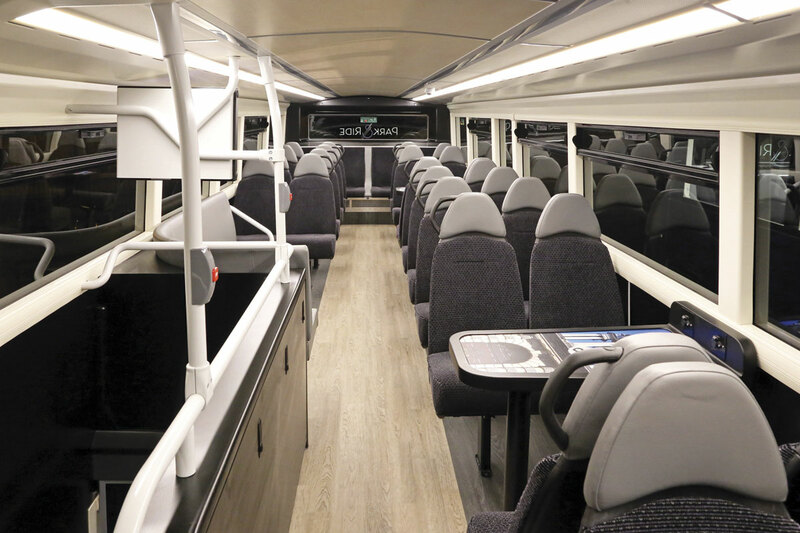 The white and dark grey interior décor reflects the schemes used in the Oxford Bus Company’s coaches on the X90 London service and provides a strong contrast for the poles and handrails. On the upper deck, seat back handles are incorporated rather than poles and the area in front of the lounge seat is totally clear. The floors are finished in two shades of wood effect material. To emphasise the added quality, the exterior finish is in shades of purple although it wasn’t possible to get a full impression of this due to the subdued lighting from a series of LED uplighters arranged around the vehicles. 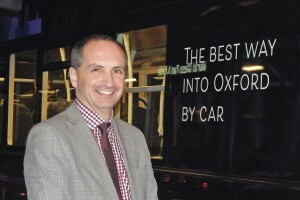 The rear of each vehicle has a unique message and image for a reason to use the park and ride service into Oxford. 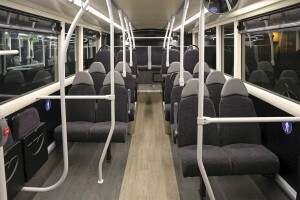 Mechanically, the Streetdecks are to Wrightbus Micro-Hybrid 2 specification although the stop-start facility will not be implemented until software is finalised by Daimler. 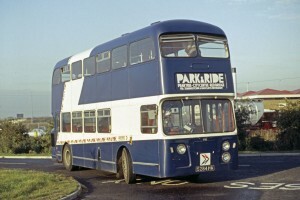 Phil had already made reference to the environmental friendliness of the Streetdeck in his address, presenting figures that showed them to significantly outperform all Euro6 cars in terms of NOx under actual conditions, being little more than half its nearest contender, coincidently produced at the BMW factory opposite the Oxford Bus Company’s depot! 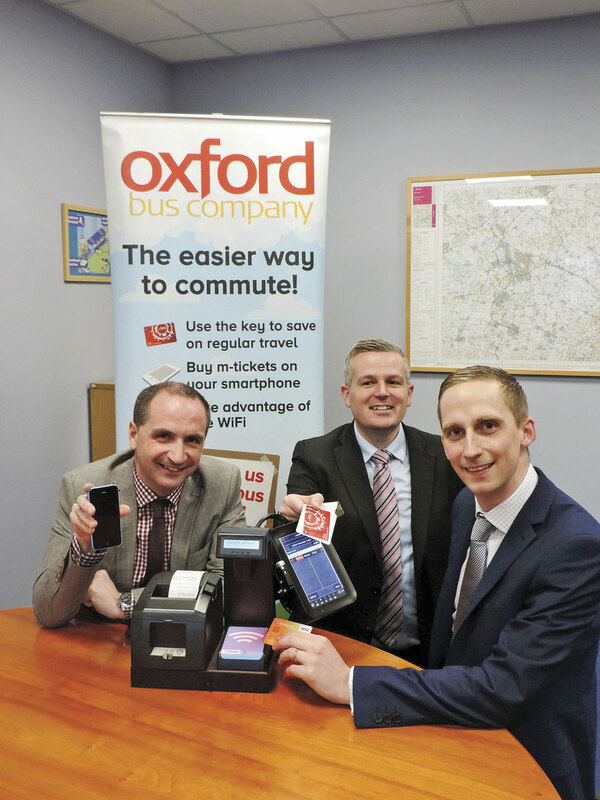 Parallel with the introduction of the new vehicles, Oxford Bus Company has selected Ticketer to provide new on board ticketing equipment for its entire fleet and those of its sister companies Thames Travel and Carousel Buses. The 282 new machines include a barcode and QR code scanner, and will be set up to accept contactless debit and credit card payments as well as the ITSO smartcard scheme the key. They are expected to be rolled out to vehicles early in 2017.